OK. In this video, we are going to go through a special type of question that's new to the GRE. This question is called a sentence equivalence question. So let's look at this question. What's going on here? Well, there's some very nice squares as you can see, and how many do we have? One, two, three, four, five, six. Aha! Six answer choices. And there are squares next to them, instead of circles and five answer choices. So you you know you're not dealing with the one blank text completion, but you're dealing with a sentence equivalence. A sentence equivalence will always have one blank. And more importantly, it will always have two, exactly two, not one, not three, not four, but two answers. And those two answers must be synonyms, or that is, relatively similar words. Of course, there's always a debate on what exactly a synonym. Not every word can be used in place of another word and in different context, but that definition aside, we mean words that are generally similar. So if you open up a thesaurus, there will be two words next to each other, so that's what we're going here for. 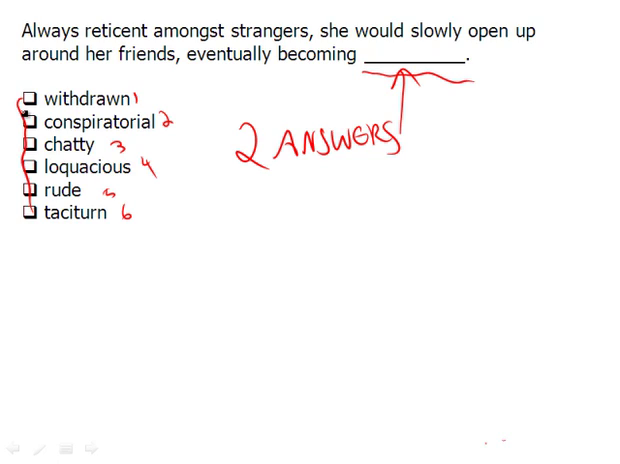 Our two answers in sentence equivalence. Besides that little twist, it's really business as usual, in the sense that we are dealing with text completion strategies. The idea of "OK. Well, we want to identify a type of sentence, and what type of sentence is this?" Let's read it. "Always reticent among strangers", that is a good word, reticent. "she would slowly open up around her friends, eventually becoming ________." So there's a shift here, a shift in a person's behavior. So among strangers, she's one way. She's quiet; that is, not talkative. She's reticent. She would slowly open up and eventually become, well, very talkative. So we just need two words that mean talkative. You can see that we've come up with our own word, and as I said, business is like usual. Then, of course, we want to just match and look in this case for synonymous words. That's the important part, words that are synonyms. So what word means which means saying much, which means talkative? Withdrawn is the opposite. Conspiratorial doesn't quite mean talking a lot. It means you're plotting. Then there is chatty. Chatty is talkative. Loquacious is a synonym, which means talkative. Notice, I circled both of them. Why? Because there are two answers. Those two words are synonyms. Sentence equivalence. Rude does not work. If you think rude works, you try to plug it back in there. She didn't say much, but with her friends, she would become rude. You would convince yourself of that interpretation. That's fine, but then look, there's no other words to match it. Again, we need synonyms or sentence equivalence, so that's gone. Taciturn is the opposite. Notice that withdrawn and taciturn are synonyms, but they're the opposite, so just because you have two synonyms and sentence equivalence doesn't mean those two synonyms are the answers. Of course, they both have to make sense in the blank, and so we have loquacious again, and check.